This Playground visualization and deepener is ideal for younger clients. 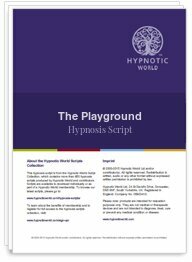 Between the ages of 2 to 9, playgrounds are often a child's favorite place to visit and this Playground Deepener hypnosis script helps children to utilize the experience to increase the depth of their trance. Children naturally have vivid imaginations and will respond readily to this Playground deepener - allowing them to become totally absorbed in the experience whilst the Hypnotherapist does the therapeutic work.